Ages 8 through 17. 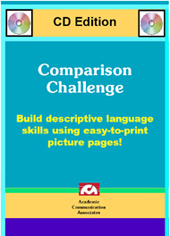 Challenge your students to give precise descriptions of pictures as they make comparisons. Each picture page contains four pictures that are almost identical. The student must carefully analyze the pictures to determine how they are different. Barrier games can also be played using the picture boards. Challenge a student to describe one of the pictures in enough detail so that a classmate can identify the picture being described. Students must pay attention to detail as they examine each of the four pictures. The downloadable file includes 50 reproducible pictures boards, each with four pictures. These pictures are great fun and challenging for students. Once you download the file, you can reproduce the pictures as often as necessary for use with students in your program. You save $14.00 by ordering the downloadable version of this product. You can save money by downloading this product instead of ordering the CD. For information, click here.